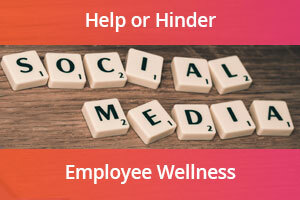 Does Social Media Help or Hinder Employee Wellness? Whether you are on Facebook, Instagram, Snapchat or one of the numerous social media networks currently available (with new networks popping up daily), you can give or receive social support with a quick click. Given these new social arenas, you have to wonder: does being social online keep us more or less connected with each other? People use social media for different reasons, spend different amounts of time on it and access it differently. Today’s social networks are a funny thing as some people become ‘friends’ without really being ‘friends’ (in the traditional sense of having a personal connection or even physically meeting each other) - especially with younger generations. So in today’s online ‘friendships’, are we more or less connected and can these connections help us be healthy and well? BEING SOCIAL AND WELL – MATCH MADE IN HEAVEN? The purpose of this post explores whether or not social media should be incorporated into online employee wellness platforms that deliver virtual wellness programs. Before jumping to conclusions, it’s important to understand the connection between social support and our health and well-being. The understanding that social support is essential to our health has been around for decades. In fact, social support is one of the key determinants of health. Why is social support so important to our well-being? Quick Tip: The more connected we are, the better health we are likely to experience. Research has shown that social media (particularly Facebook) has been used as a meaningful place for seeking and receiving social support. Research also supports that social media is positively associated with support such as sharing information, advice, and companionship. Another study examined the relationship between social media use and social support revealed that frequency of Facebook use was the strongest predictor of how receptive people are to receiving social support (even stronger than emotional closeness). Quick Tip: High-frequency social media users are most receptive to receiving support online. Another study revealed the many different applications of Facebook (for social support) where people with breast cancer used it for patient and caregiver support, informational support and even fundraising. Literature has also shown that people who have more Facebook friends experience reduced stress, less physical illness, and greater well-being. This implies that social media may be another avenue in which social support may influence health outcomes. Quick Tip: People with more Facebook friends have less stress, illness and greater well-being. However, not all social media use positively impacts an individual’s social support network. One study by Heewon Kim, 2014 found that fixed Internet use negatively impacts life satisfaction. People who use desktop computers as the main way to login to social networks are more likely to be isolated (and feel less satisfied with their life) as they tend to limit in-person social engagement with peers. On the other hand, Ishii (2004) found that mobile Internet use has positive effects on sociability. Heewon Kim's study (2014) also seems to support this, implying that Internet use on the move or in social surroundings may actually contribute to interpersonal interactions. Quick Tip: If you are accessing social networks, do it via mobile device vs. at home. In light of all these findings, you could reasonably argue that using social media for social support is an effective way to complement and reinforce our traditional means of receiving and giving support (rather than as a substitute for it). EMPLOYEE WELLNESS PLATFORMS – SOCIAL OR NOT? Should social media be included in online wellness platforms for virtual wellness programs? Act as a source of motivation for participants to help them achieve their wellness goals. Help engage employees in wellness programs. Improve the social environment in which wellness programs take place. Complement conventional avenues of social support. Increase the likelihood of employees in attaining better health. Contribute to the better exchange and sharing of health information and/or advice either peer-to-peer or in groups. Influence peer-to-peer health education by providing employees with the proper resources to help participants achieve wellness goals. The benefits of social media in employee wellness far outweigh any potential drawbacks. Social media tools in an online employee wellness platform could very well be the cornerstone of any successful virtual wellness program. NEED A WELLNESS PLATFORM WITH SOCIAL MEDIA? The CoreHealth employee wellness platform includes numerous social networking tools for participants to use including: message boards, video chat, social sharing and integration with external social sites. Our wellness customers around the globe tell us how much employees love this feature. See it in action. Check out these other great resources to help you grow your wellness revenue. Comprehensive Guide to Wellness Technology - Discover everything you need to know about wellness technology in this eBook. How to Sell Wellness to C-Suite - download the fully editable powerpoint presentation template that you can tailor to present to your leadership team. Technology Requirement Checklist – If you researching new wellness technology, download this free, fully editable checklist to assist you with identifying requirements and priorities. CoreHealth Technologies Inc. is the leading corporate wellness platform trusted by more than 1000 organizations, ranging from medium-sized businesses to Fortune 500 enterprises. At CoreHealth, we believe that developing the best employee wellness programs is all about giving wellness companies the right code, design and access to the latest innovations. With the most customization, integrations and reliability of any software in its class, CoreHealth’s powerful platform lets users focus on growing great companies. For more information, visit the CoreHealth website. Cindy Danielson is CoreHealth's Marketing Maverick and team leader with a passion for connecting people and technology. In addition to marketing, she has experience as a Benefits Brokers, HR Professional and Project Manager. 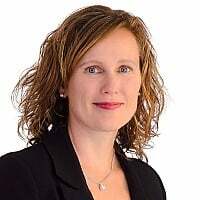 She loves sales and marketing process while leveraging systems such as Salesforce, Microsoft Dynamics CRM and HubSpot. © 2017 Corehealth Technologies Inc.